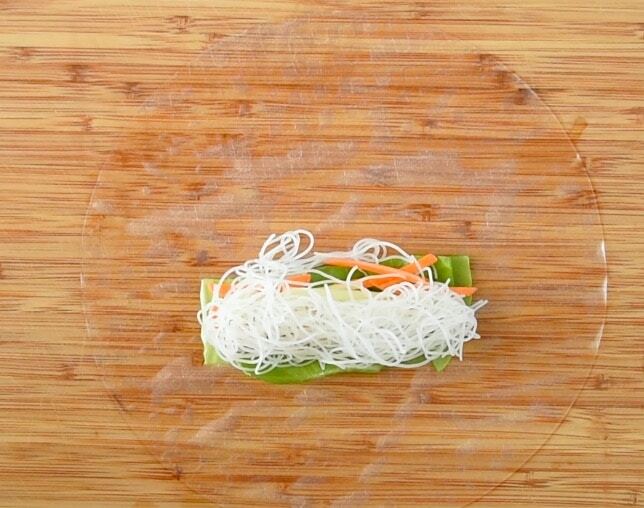 These Vietnamese Summer Shrimp Vegetable Rolls are a twist on the traditional spring roll minus the pork and the addition of a few more fresh veggies to bring the spring roll into summer. These rolls are my take on a light and easy meal or appetizer that is perfect for the warm summer days and nights. Fresh crunchy carrots and cucumber with lettuce, rice noodles and a trio of fresh herbs because I couldn’t decide which to use, so I used all 3 and they all are delicious together. What herbs you use, is up to you. With the addition fresh shrimp all wrapped in rice paper, all you need to do is dip them into a good sauce, of which I have a choice of 3. I have a recipe for a Trio of Asian Dipping Sauces that has consistently been one of my most popular recipes since December 2014. I thought it was time to make something to give my readers something dip into the sauces. If you take some help from the grocery store and buy already cooked shrimp, the only ‘cooking’ (and it’s not really cooking) is to prepare the rice noodles. Fried egg rolls seemed too heavy for summer and these Vietnamese Summer Shrimp Vegetable Rolls (Gỏi cuốn) seemed like the logical choice. Are egg rolls and spring rolls the same thing? No, egg rolls are usually pork and cabbage wrapped in thin sheets of dough and fried. Spring rolls are much lighter with pork, shrimp and rice noodles and wrapped in rice paper, not fried. Soak 1 sheet of rice paper in warm water for 5 seconds. 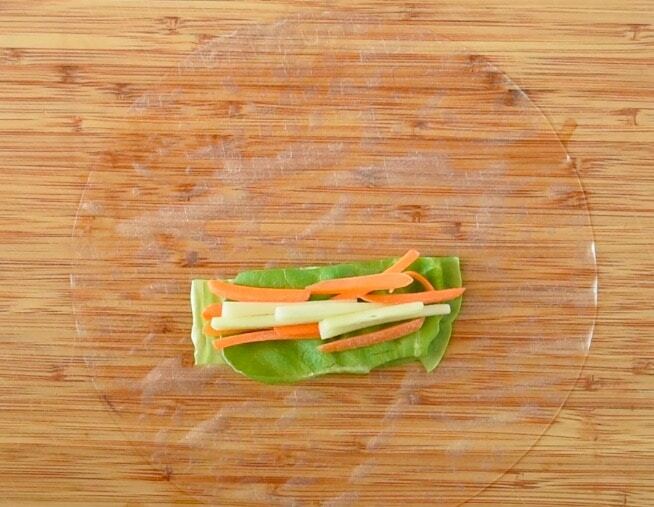 Lay the wrapper flat on a cutting board and add lettuce, carrots and cucumber. Lay mint, basil and cilantro on top of rice noodles. Place 3 shrimp in front of the stack (this way they will show through the roll). Starting closest to you, take the edge of the wrapper and roll over the veggies. When you get to the shrimp, tuck in the sides and continue rolling. 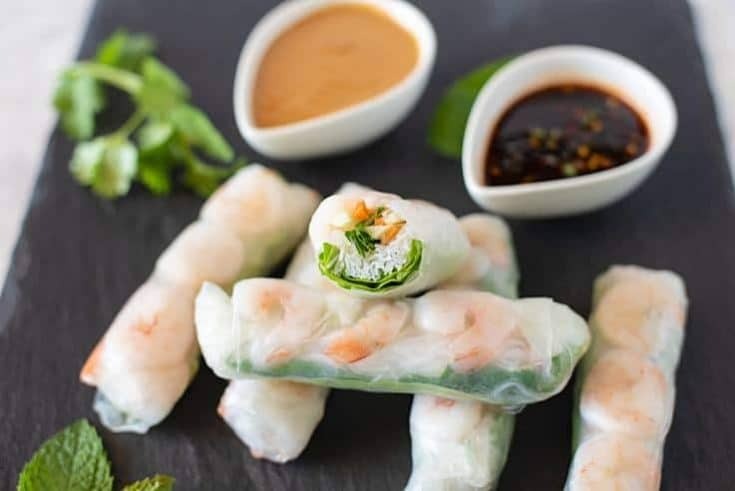 If you’ve tried these Vietnamese Summer Shrimp Vegetable Rolls or any other recipe on the blog then don’t forget to rate the recipe and let me know how you got on in the comments below. I love to hear from my readers! You can also FOLLOW ME on FACEBOOK, TWITTER, INSTAGRAM and PINTEREST to see daily recipe updates. 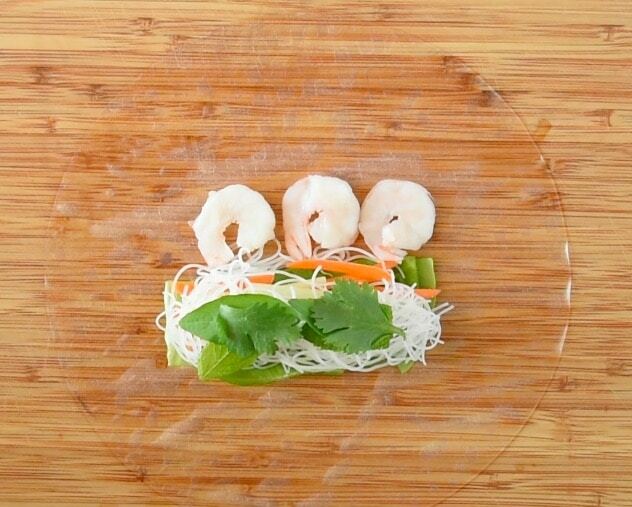 Fresh shrimp, lettuce, carrots, cucumber, rice noodles and herbs are wrapped in rice paper. 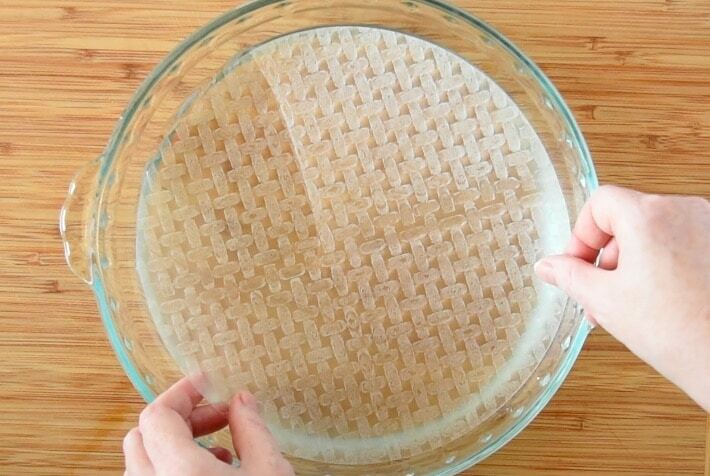 Soften a rice paper in the warm water for 5 seconds. Lay the rice paper on a board in front of you. 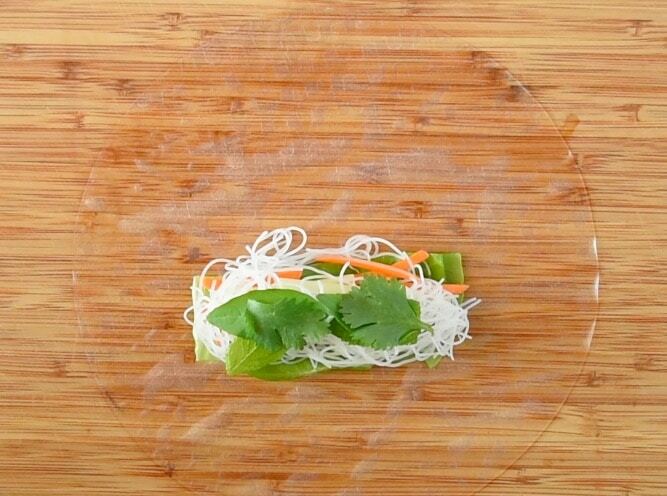 To the center of the rice paper add lettuce, carrots, cucumber, noodles, mint, basil and cilantro. Line 3 shrimp in front of the stack furthest away from you. Starting at the edge closest to you, roll the rice paper over the noodles. 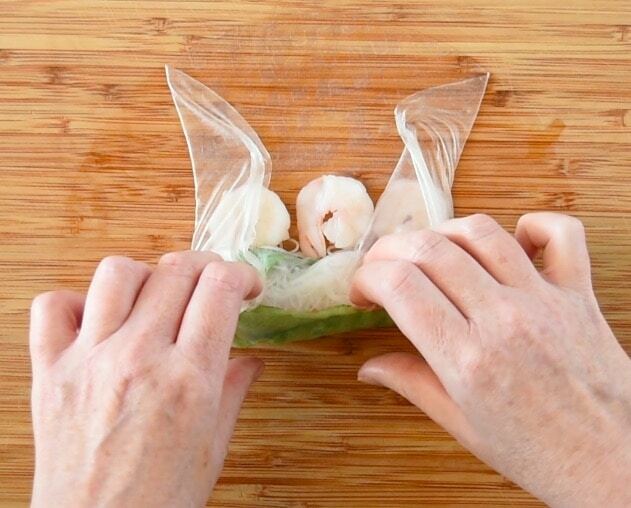 Before you get to the shrimp, tuck in the sides, then continue to roll as tight as you can. Roll back and forth on the board to seal the roll. You should be able to clearly see the shrimp. Made these last night. Such a simple, easy recipe to put together. I didn’t have fresh basil or mint so just topped with the cilantro and a little green onion. Can probably sub other veggies etc. as well. We gobbled them up during the fb game. I’m happy they were a hit. What I do like about these rolls is that they can be customizable. Thank you for leaving feedback. These look so delicious and cute… Must-try Recipe!!! I’ve never added mint to mine before. I’m definitely going to try that. I’ve never had this before but it looks wonderful! The dipping sauces are yum! It’s a wonderful light dish for the summer. These look so good! I love the dipping sauces and that you gave a how-to video on the wrapping portion too. I’ve had Vietnamese summer rolls on my to make list for a while, and this is definitely making me want to make them soon, especially with those dipping sauces. I like that there is no seaweed used! These look fantastic and LOVE shrimp!